Coming soon to 6401 Hillcrest Avenue: a hybrid style ice cream shop from three Southern Methodist University graduates. Baldo’s, according to its website, considers itself a scoop shop cafe. Now before you question what that means, they define it as a hybrid ice cream and coffee shop; a nostalgic creamery with a twist of discovery; and a small restaurant that’s an especially good place to exercise your cheat day. 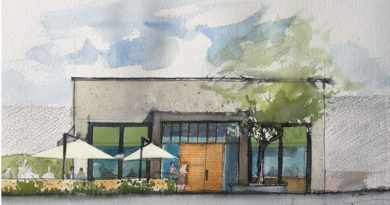 The first scoop shop cafe in DFW will take residence in the former complex that housed Goff’s, on Hillcrest. But this isn’t just another trendy rolled ice cream shop. Baldo’s is dripping with nostalgia, surprise, and culinary craftsmanship. (from left to right, Tyler Kleinert (Executive Director, The Tritex Group), Will Ammons (Director of The Tritex Group), Schuyler Grey (Director of The Tritex Group), Aldo Sandoval (Executive Chef of Baldo’s)). The Tritex Group, based in Dallas, has been researching and planning for the launch of its first entrepreneurial project for the past six months. “Vanilla is familiar. It’s classic. It’s comfortable,” the team says. “But vanilla doesn’t provide us with new experiences. It doesn’t expand our horizons or prompt us to share with others. Options like red velvet, five spice, chai tea, and the trademark cinnamon cayenne will fill their menu. The man behind the scoop, Executive Chef Aldo Sandoval, first got his start on the Dallas culinary scene as a sous chef at The Mansion on Turtle Creek and most recently the Head Pastry Chef at Uchi/Uchiba. An artist of many mediums, Sandoval channels his creativity by introducing savory flavors to classic ice creams. But the vision doesn’t stop there – Baldo’s plans to draw on Sandoval’s experience by offering pastries and a secret Sunday Brunch. Baldo’s plans to open its doors to the public in early September 2018. For a sneak peek, visit baldosdallas.com or follow them on Instagram @baldosicecream.